The startup is now offering end-to-end spaceflight services. Rocket Lab's Photon satellite platform, which is an evolution of the "kick stage" for the company's Electron rocket. Rocket Lab isn't content to just build launch vehicles anymore. 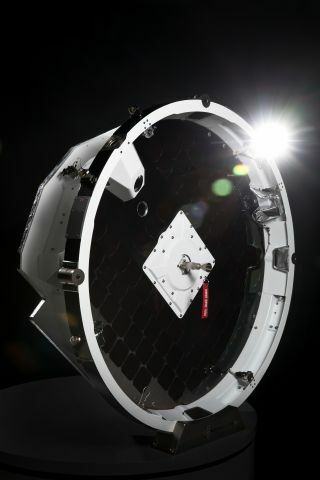 The California-based startup, which lofts small spacecraft to orbit with a rocket called Electron, just unveiled an in-house satellite platform designed to host customer payloads. The idea behind this satellite line, known as Photon, is to provide end-to-end spaceflight services, allowing customers to concentrate on developing their payloads and generating revenue, Rocket Lab representatives said. The project was unveiled Monday (April 8) at the 35th Space Symposium in Colorado Springs, Colorado. "Small-satellite operators want to focus on providing data or services from space, but building satellite hardware is a significant barrier to achieving this," Rocket Lab CEO Peter Beck said in a statement. "As the turnkey solution for complete small-satellite missions, Rocket Lab brings space within easy reach," Beck added. "We enable our customers to focus on their payload and mission. We look after the rest." Photon fits well with Rocket Lab's core mission, which involves greatly increasing access to space. Indeed, the satellite program was part of Rocket Lab's vision from the very beginning, Beck said. The other part of that vision centers on the 57-foot-tall (17 meters) Electron, a two-stage, expendable rocket that can loft about 500 lbs. (227 kilograms) to orbit on each $5 million liftoff. Electron has flown four satellite-lofting missions to date, all of them successful. The most recent liftoff, which orbited the R3D2 experimental satellite for the United States Defense Advanced Research Projects Agency (DARPA), occurred late last month. A Photon satellite (front) and an Electron rocket upper stage on the floor at a Rocket Lab facility. The Photon satellite is an evolution of the Electron's "kick stage," a single-engine craft that circularizes the orbits of small satellites toward the end of Rocket Lab missions. Photon is designed to operate in low-Earth orbit for up to five years and can accommodate payloads weighing as much as 375 lbs. (170 kg), Rocket Lab representatives said. The satellite platform features its own avionics suite and communications and attitude-control systems. Photons are built at Rocket Lab's headquarters in Huntington Beach, California. The first operational Photon is scheduled to launch late this year, from the company's New Zealand pad. Customer missions should follow in 2020, Rocket Lab representatives said. When the Photon line is up and running, the time from order to launch will be as little as four months, company representatives added.